Located in the Albion Maple Ridge real estate district, Montgomery Acres is a master planned collection of 83 three and four bedroom single family residences brought to the market by Epic Homes. Designed with craftsman style architecture to blend with the surrounding natural settings, the Montgomery Acres Maple Ridge homes will feature 10 foot ceiling heights on the main living level, full basements, gourmet kitchens and a spectacular free standing soaker tub in every master bedroom ensuite bathroom. The prices for the Maple Ridge single family homes is expected to start from $509,960, making them attainable for many families. Sales are expected to start in October. Montgomery Acres is located at 24405 – 112 Ave Maple Ridge. The official grand opening will be October 26, 2013! The single family detached Maple Ridge homes will be ready for move-ins in February 2014 and the floor plans range in size between 1,850 to 2,270 square feet. The interior design is by LE Interiors and the housing designer is by Grand Miller at i3 Design Studio. The Montgomery Acres Maple Ridge by Epic Homes web site is located at www.montgomeryacres.com, so please register your interest today! Single Family Maple Ridge Detached Homes for Sale from Low $500’s! 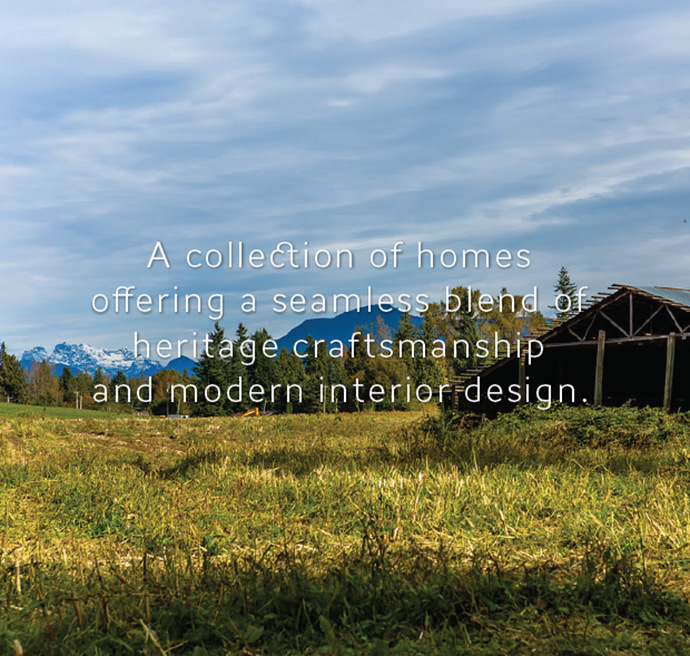 Be the first to have the opportunity to own a piece of Maple Ridge heritage at Montgomery Acres – a new neighbourhood of detached single family homes built on the picturesque pastures where the Montgomery family cultivated the land and enriched the community for over 65 years. Now, many more families will be able to build their own legacies in these creekside Maple Ridge Montgomery Acres homes blending heritage style craftsman exteriors with modern interiors and features. Some of the highlights of these new single family Maple Ridge homes for sale include bright open floor pans, covered front decks, quartz counters, garages, full basements, spa style master ensuite bathrooms with free standing soaker tub plus many other impressive features. As well, the brand new Maple Ridge Montgomery Acres homes for sale will be situated on a planned streetscape with a private community feel. Each home is unique and if you are one of the first five home buyers, you will receive an early bird discount for a limited time offer only! The Montgomery Acres Maple Ridge single family homes start from just $509,980. Tree-lined pastures and the flowing waters of Kanaka Creek Maple Ridge frame an extraordinary new community in the Lower Mainland. The Montgomery Acres Maple Ridge development is a fine collection of 83 single family detached homes for sale offering a seamless blend of heritage craftsmanship and modern interior design. Each of the new Maple Ridge homes offers unique finishes, 3 and 4 bedroom floor plans ranging from 1850 square feet to over 2200 square feet, with the bonus of a full garage as well as a full basement. Take your next step into comfort and convenience at Montgomery Acres Maple Ridge. Creekside heritage living with a modern twist is now here. The community is nestled right at the doorstep of Kanaka Creek Regional Parkland is surrounded by walking and biking trails, Kanaka Creek, nature views, the Fraser River as well as Allouette Lake. Phase 1 is ready to be released for presale with estimated completion in February 2014. Montgomery Acres is a unique and beautiful development in the heart of Maple Ridge BC. Here, you will find craftsman style Cape Cod influenced architecture in addition to a mix of natural and eco-sensitive materials that blend seamlessly into the surrounding natural setting. In addition, Montgomery Acres features natural wood soffits, welcoming front decks and low maintenance vinyl siding. Other exterior features include planned streetscapes that are well lit and very safe in addition to rear decks and patios so that you can increase your living space outward. The new Maple Ridge homes will feature high efficiency furnace and low-E windows. There is rough-ins for future solar hot water heating systems in addition to high tech wiring. There is also a full 12” topsoil that is provided for your lawn and yard. All homes are covered by the WBI Home Warranty of 2-5-10 years. The interiors will have ten foot high ceilings on the main floor (that’s high!) in addition to oversized main entrance doors and large windows. Other Montgomery Acres Maple Ridge home features include social kitchen openings to eating areas and a great room, solid quartz stone counters in the ensuites and kitchens as well as efficient natural gas fireplace on the main floor. Other features include Moen faucets with lifetime warranty, custom wood spindle and handrails on staircases and custom wood cabinetry in stained maple or painted white. Tehre is hand set ceramic tiled flooring in the power room, ensuite and entrance. There are also full basements. The bathrooms at the new Maple Ridge Montgomery Acres homes will include quality Moen fixtures, MAXX soaker tubs in all ensuites and large luxurious five piece ensuite bathrooms. Other features include double sinks, ceramic tiled flooring with wall tile work and master ensuites with four foot showers and free standing soaker tub. There’s also a large 80 gallon hot water tank! The kitchens at the Montgomery Acres Maple Ridge single family detached homes will features solid quartz counters, custom cabinetry, large islands (some with eating bars) and wood laminate wide plank floors. Other kitchen features include recessed pot lights, Moen faucette with pull out spray, dual basin stainless steel under mount sink and ceramic full backplash. There are five homesteads/floor plans released at Montgomery Acres and all are 3 level homes with plenty of space for storage and to grow into. All homes have full basements and attached garages in addition to laundry rooms. In terms of the Montgomery Acres homes location in Maple Ridge, owners will be very close to many things including top ranked schools (both elementary and secondary schools), private schools, TARGET, Haney Place Mall, Thrifty Foods and Valley Fair Mall. Other highlights around you include the Maple Ridge Equestrian-Sport Centre, Golden Ears Riding Stable, Davison’s pool, Hacker’s Haven Golf Course, Historic Haney House, Maple Ridge Historical Museum, Thomas Haney Centre, Planet Ice & Albion Sports Park, Cliff Falls and Bell Irving Fish Hatchery. In addition, the new Maple Ridge Montgomery Acres homes are close to the West Coast Express train station that can get you to downtown Vancouver. For more information, please visit www.montgomeryacres.com.